The story that he tells is of his wife who had died, which led to him being unable to write any more. He tries to deal with her death and his traumatized children, in the only ways he knows, which are awkward, strained, bitter and desperately loving. As he says, he does not know how to be a father. He thinks of the words used in the Roman Catholic service before communion: “Only say the Word, And I shall be healed”, but rather than hope that Christ’s blessing will make things better, because he has lost his faith, he hopes that expressing his pain in words will heal him. He also hopes for one magical word or deed that will just put things back the way they were, a sort of ‘abracadabra’ for his life. Williams is an expert in precisely and honestly expressing the most human, most complex emotions. Even when writing about the most horrible occurrences, the most destructive cruelty, he never overdramatizes. He says in mature and elegant language what most people feel, but cannot pinpoint. 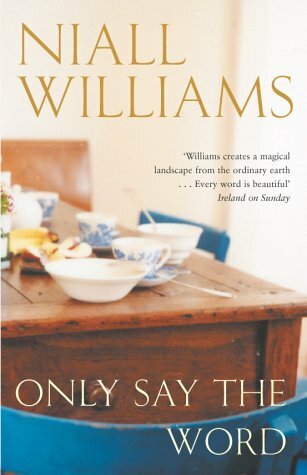 Williams has lately become quite fashionable as a leading Irish writer, but this novel should be read and reread not because he is in vogue, but because of the essential truths in it of which we should be reminded every so often. For a review of Williams’ novel John, go here.